Photos by Liz (LS), Terry (TC), Jim (JK), David M (DM), Tony (TM), and Roger (RM). 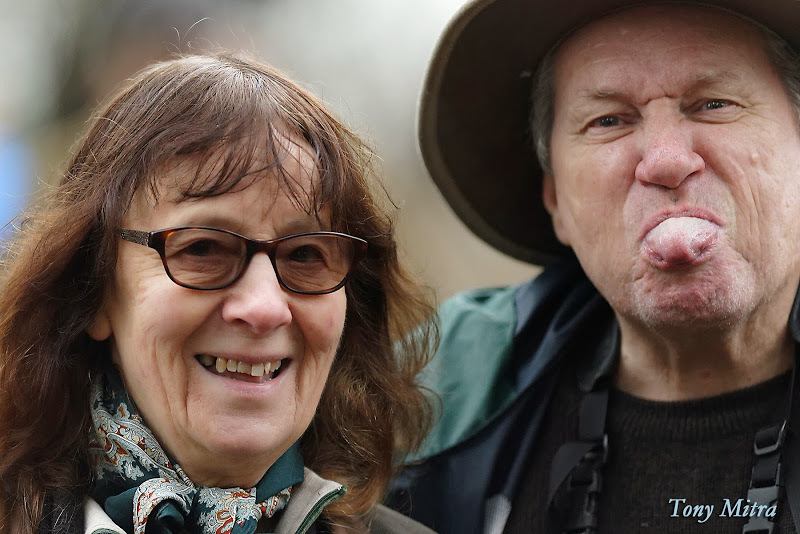 Twenty-one DNCBers enjoyed a bountiful birding morning, 56 years after the “Day the Music Died”, at our “Mecca” Reifel Bird Sanctuary. Hi-lites included rarities Harris’s and Swamp Sparrows, Northern Saw-whet and Great Horned Owls, three Wren species, and lots of ducks in gorgeous breeding plumage. Check out the photo evidence by Liz, Terry, Jim and David M on our DNCB Picasa site, Tony’s Picasa link, and a few here by Roger. Two cars left Petra’s at 8:00 a.m. for the Tsawwassen Ferry Port; Tony took Terry and Gerhard; Roger had PB Lorna (welcome back to the fold), Jim K and me. At our “pull-over” stop along the causeway were lots of American Wigeon, both Double-crested and Pelagic Cormorants, a few Common Loons and Common Goldeneye. Across the road on the south side were lots of Surf Scoters and a couple of Black Oystercatchers. 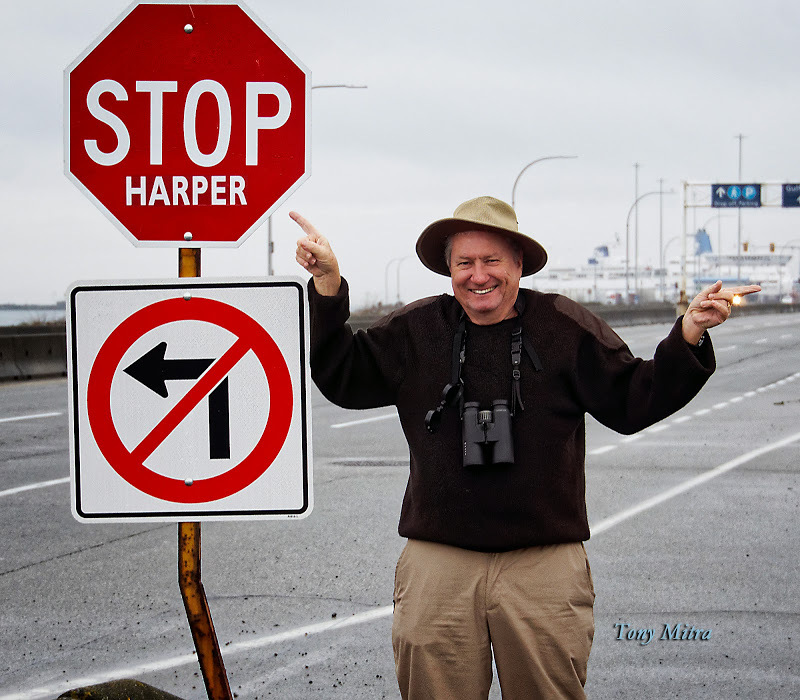 A “Harper” Stop Sign gave us a laugh with a No Left Turn sign below it (no political comment here). Following sign photos, we drove to the Terminal where we spotted a Red-necked Grebe and a raft of Bonaparte’s Gulls, which we don’t often see. We continued through the TFN land to the overpass over the Deltaport Highway. A Hawk with a big white Tag (R8) on its right wing caught our attention. It was a Rough-legged Hawk banded by the Airport Wildlife team in November 2014. Feb. 8 Thank you for reporting your sighting of Rough-legged Hawk R8… I tagged R8 as a Hatch Year bird at the Vancouver International Airport (YVR) on 10 November 2014 and released him the next day in Chilliwack, BC. Yours is the 10th sighting of this bird since it was translocated to Chilliwack (all in the same area). Gary Searing. Already past 9:00 a.m., we hurried to get to Reifel to meet the masses. The other 14 were not too disturbed by our tardiness. They saw both Bewick’s and Pacific Wrens, Anna’s Hummingbirds and early-arrived Barn Swallows near the entrance, while they entertained themselves hand-feeding some of the 11 Sandhill Cranes hanging around the Sanctuary. A Cooper’s Hawk posed in a tree and a pair of Eurasian Wigeon were cruising in the office pond (not common there). Almost 50 Great Blue Herons were roosting around the first pond and they did not disturb the 4 Winter resident Black-crowned Night-Herons. 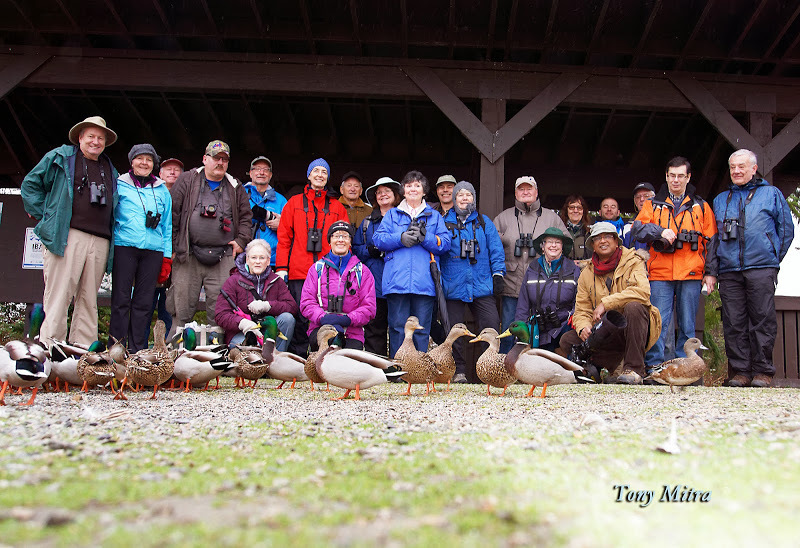 To get me off the hook early, Tony took the obligatory Group Photo at the Reifel Snow Goose Info Board before we started our walk. They love their names in print so the 21 were: Photogs Liz, Langley’s Wim, Marion S and another “returnee” David M, Rob & Marylile, Aussie Nance, our Guru Mother Mary Reifel, non-teaching teacher Greg, an ancient returnee Gord L, White Rock Alice without Al, Kirsten, Fern and the loquacious Otto, plus the earlier-noted seven. Following Mary’s astute guidance, we followed the “left” trail (again, no political comment). Hooded Mergansers, Bufflehead, Lesser Scaup, Northern Shovelers, Northern Pintail, Gadwall, American Coots and a Ring-necked Duck were in nice plumage. And everyone’s favourites, Wood Ducks, were gorgeous, and almost rampant throughout the Sanctuary. Several DNCBers resembled SAVE-ON Grocery Store clients with their bags of food. This proved very helpful as not only the Black-capped Chickadees ate seeds from their hands, but also did Red-winged Blackbirds and even a Red-breasted Nuthatch. Lots of V’s of Snow Geese flying over us and Northern Harriers, Bald Eagles and the occasional Red-tailed Hawk cruising over the marshes. From the outer dike trail, we saw a regal Peregrine Falcon perch then take off. He may have been after the flock of Shorebirds (probably Black-bellied Plovers) flying over the water. The 100 or so Trumpeter Swans were not bothered. We heard Marsh Wrens and Virginia Rails and some of the group saw a Rail walking near the Tower. Purple Finches (all female?) were feeding on the crab apple bushes as a Downy Woodpecker pecked below. 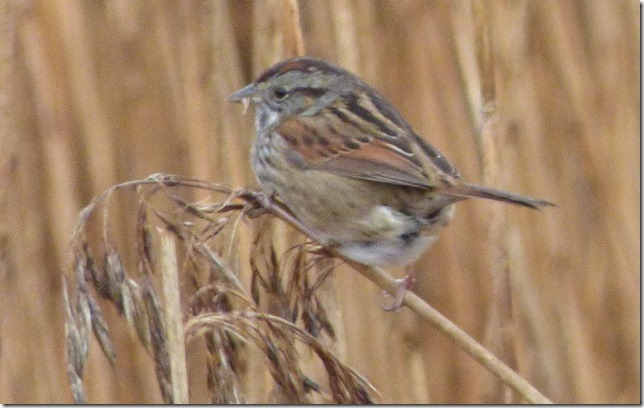 At the Tower, some saw and photographed the Swamp Sparrow that has been hanging around there this Winter. We think the Cedar and Bohemian Waxwings have left the Sanctuary. As we walked back toward the entrance, we stopped to check out three well-hidden Northern Saw-whet Owls. A friendly visitor also showed us the roosting Great Horned Owl. He commented that our group was very nice, but a bit “noisy”. Dah! Lots of little birds along this trail too including: Golden-crowned Kinglets, Song, Fox and Golden-crowned Sparrows (no Lincoln seen today), Spotted Towhees, Juncos, etc. Back near the entrance, with the help of Otto’s never-ending feed bag, and keen-eyed Liz, the Harris’s Sparrow finally showed up and everyone got great looks and photos. Some continued on next door to Alaksen and saw a Barred Owl while others went up Mount Seymour to get beaut shots of the Gray-crowned Rosy-Finches. Nine of us retired again to Speed’s Pub in Ladner for the beer, fish & chips Special. Not unexpectedly on our Reifel outings, we saw a tonne of species today, most up-close-and-personal, and many in their beautiful breeding plumages. Plus the weather was mild and dry, and a few of the conversations were less than hideous, Otto and the ILB excepted. An awesome outing. Next Tuesday, February 10, the regular DNCB meeting and departure will be Petra’s at 8:00 a.m. to Stanley Park. Then meet around 9:00 a.m. at the Second Beach Parking Lot near the swimming Pool. Some may want to join Rob & Marylile for lunch at the Royal Vancouver Yacht Club’s Mermaid Restaurant (advise Marylile). Sandra and I leave next Tuesday for a week’s “holiday” in Ontario visiting friends and relatives, so I will not be at Stanley Park. Don’t forget our monthly Delta Nats meeting at Cammidge House on Monday, Feb. 9. Mark Drever will be presenting on the “Northward Migration of Shorebirds”. Note that we have CHANGED the DATE and VENUE of future monthly meetings: starting TUESDAY, MARCH 3, the DNS monthly meetings will be at the larger Benediction Lutheran Church at 56th and 6th in Tsawwassen. This entry was posted in *DNCB, Bald Eagle, Barred Owl, Black Oystercatcher, Black-crowned Night-Heron, Bonaparte's Gull, Cooper's Hawk, Eurasian Wigeon, Gray-crowned Rosy-Finch, Great Horned Owl, Harris's Sparrow, Northern Harrier, Northern Saw-whet Owl, Pelagic Cormorant, Peregrine Falcon, Red-necked Grebe, Red-tailed Hawk, Reifel, Rough-legged Hawk, Sandhill Crane, Swamp Sparrow, Tsawwassen Ferry Port. Bookmark the permalink. Another great post Tom. Looking forward to getting out more frequently with the group.